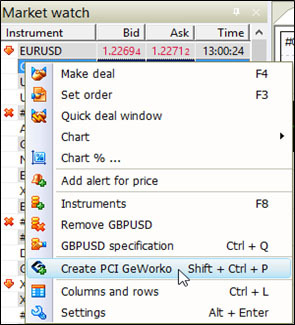 In order to create a new synthetic instrument (hereafter referred to as PCI), right-click on "Market watch" window and select "Create PCI" option from the drop-down menu. In the opened "Create Personal Composite Instrument" window you will need to specify assets which should be included in base and quoted parts of your PCI. You can find the assets you need in the list of "Available assets". For example, let us create a new PCI, the base part of which is a portfolio, consisting of Future CFDs on several crops, and the quoted part is a portfolio, consisting of Gold and Silver. Select an asset by a click and press the relocation button (“>”) for moving the asset into "Base" or "Quotation" table. As a result, the selected asset appears in the table and its name is removed from the list of "Available assets", as an asset can be included only once into one of the tables of the created PCI. Next, you will need to set volumes for each asset included in the PCI. 3. In the value of the asset in "Volume [USD]" field. Note that in the first and second ways the asset values are calculated in USD at the moment of PCI creation. In this example base part is 1 contract of Nd100 and the quoted part – 1 contract of SP500. This PCI provides good opportunity for spread (pair) trading of two assets- stock index of hi-tech companies Nd100 and wide stock index SP500. Let us save this PCI under the name offered by the terminal: “&Nd100/SP500”. In the example 2 we will set the assets of the base part(CFD on several types of grain products) in equal percents of the limit volume of 100 000 USD, and the assets of the quoted part - in units of volumes of the assets – 40 ounces of Gold and 2000 ounces of Silver. To complete the creation process of the new PCI, you need to choose a name and save the new instrument. If you select "Save" option, PCI will be saved under the name of the given structure, including the names of its assets, but not more than 20 characters. In the example 2 we will select "Save as…" option, enter “&grain/precious_met” in "Name" field and press "Save" button. To complete the PCI creation process, close the creation window by "Close" button (you can select another option, including two actions – "Close and add to used instruments"). You have successfully created your first PCI. After your PCI is created, you can add it to the list of used instruments, open the chart of its price history, make a technical analysis on the created instrument and trade the new instrument. One PCI may contain not more than 25 assets (totally in base and quoted parts). 100 PCI can be created on one trading account. The number of PCIs does not exceed 10 in the list of instruments in use (for trading and building charts) in one workspace. Base and quoted parts of PCI may consist of the same assets including USD. Current PCI quotations are calculated from current Bid and Ask values of all components, taking into consideration their weights in the overall structure of the instrument. At the time of receiving a new tick (changes of the quotation) of any of the PCI component the server of NetTradeX terminal performs a calculation for conventional buying and selling of PCI unit, which provides current Bid and Ask values for PCI. PCI price is equal to the value of the base components in USD, divided by the value of the quoted components in USD in the set volumes of all components. At the moment of creation the initial PCI price is calculated as Current Total [USD] of the Base part, divided by Current Total [USD] of the Quotation part. In our Example 2 we will get 100000 / 91141.20 = 1.0972. Let us suppose that a lot of time has passed after the creation of this personal instrument and the quotations of its components have significantly changed. We will illustrate the calculations of the current quotation and calculations for a real buy deal of our PCI unit. In the Open positions window a line with Buy position for our PCI will appear. PCI quotation (Ask) is calculated at the initially set volumes of all the PCI components and is equal to (68.49 * 377.8+72.48 * 348.3+23.46 * 1026.9+42.85*544.8) / (2000 * 17.195+40 * 1228.66) = 1.17986. Pay attention to the following features of order execution with PCI components. Deals with the base components of the personal instrument are performed in volumes set during the creation of this instrument. Deals with the quoted components of the personal instrument are performed in the calculated volumes: initially set volumes of the components are multiplied by the current PCI quotation. For example, for Silver the volume will be equal to 2000*1.17986 = 2359.72 ounces. If the volume of the PCI is not equal to 1, all volumes of the components will be normalized to the PCI volume. Preliminary calculation of the volumes of PCI components during the deal can be seen in the Possible PCI Base Positions section of the Make Deal dialogue window. Let us note that during the performance of the deal:1) The sum of the values (in USD) of the base components must be equal to the sum of the values (in USD) of the quoted components.2) The percentage of each component (in USD) is maintained equal to the initial percentage set during the creation of PCI. For example, the set relationship of XAG and XAU volumes is equal to 2000/40 = 50, which is maintained during the conventional deal as well: 2194.40/43.89 = 50. Let us also note that both our PCI positions and the positions on its components exist on client’s terminal. Those deals of the components are received (and positions on components are being opened) on NetTradeX server, where the transfer of positions on components to the liquidity providers and hedging takes place. Your created PCIs are stored on the server of NetTradeX platform. If you delete a specific PCI in your NetTradeX terminal (see “Delete” function in the picture below), then it will be also deleted from the server. However, you can save your PCIs on a hard disk drive. You can transfer your created PCIs to a hard disk drive as a file with ".pci" extension. To do this, select “Add instruments to use…” function in the “Market Watch” window and in the opened “Instrument Browser” dialog window on “My Instruments” line expand the list of your PCIs. Next, on the line with the name of the exported PCI, call the context menu (right-click) and select “Export” function. In the opened standard dialog window, create a file with “.pci” extension in the desired folder on the disk. The name of the file may differ from the name of PCI. Moreover, if there is a slash symbol “/” in the name of the instrument, then this symbol should be replaced by another symbol in the file name for PCI. To import the file with “.pci” extension, you should select “Add Instruments to use…” function in the “Market Watch window of the terminal and in the opened “Instrument Browser” dialog window on “My Instruments” line call the context menu (right-click). Next, select “Import” function and in the opened standard dialog window choose a file with “.pci” extension from the file on the disk and download this file to NetTradeX terminal. In particular, this file may be from the PCI Library on the company's website, which should be first downloaded from the corresponding page of the website and transferred to the file on a hard disk drive of a user.